The Tower of Life is an easy quest, which most players can finish without too much trouble. After this quest, a dungeon becomes available where 'Creature Creation' at its best can be practiced. In total, six different creatures can be 'made' if you bring the right materials. This guide will attempt to offer you an insight in how to use this to better a few of your non-combat skills. 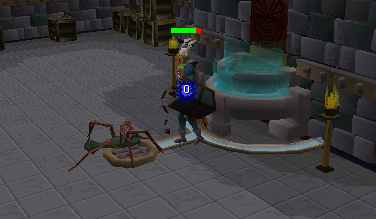 Sadly, for those who abhor combat, a fair amount of combat needs to be done to fully take advantage of the items these creatures drop. Located south of East Ardougne, this 'Paradise for the Herblorist' can be easily reached in two different ways, one slow and one very fast. 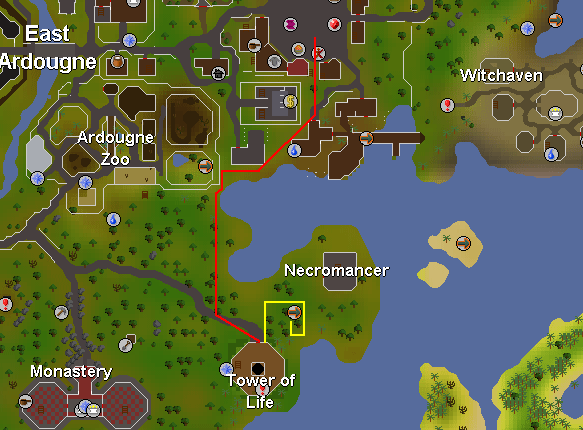 The slow boat to the tower, is walking from the teleport point in East Ardougne; the fast way is to use the Fairy Ring system by choosing the DJP combination. Upon entering the tower walk south and climb down the ladder to enter the realm of Homunculus, the being you set free during the quest. The dungeon is home to the Homunculus and he is the only inhabitant, save those monsters you are about to create. In six locations, there are 'Altars of Life'. Moreover, these are the objective of your endeavors. At Altar 1 a level 46 Swordchick is created from a raw Swordfish and a raw Chicken. At Altar 2 a level 42 Spidine is made from Red Spiders eggs and a Sardine. 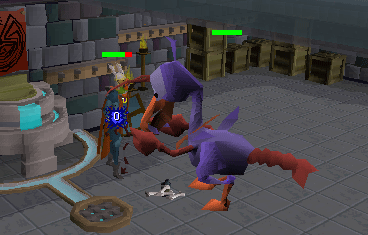 At Altar 3 a level 87 Jubster has its origin in Jubbly meat and a Lobster. At Altar 4 a level 19 Newtroost spawns from an Eye of Newt and Feather. 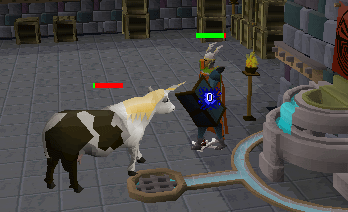 At Altar 5 a level 25 Unicow has a mother in a Unicorn Horn and a father in a Cow Hide. At Altar 6 a level 108 Frogeel appears from a raw Cave Eel and a Giant Frog's leg. To create the monster of your choice use the needed items on the Symbol of Life and then choose the option 'Activate Symbol of Life'. Homunculus will oblige and the creature appears and will instantly attack you. In a way this is very easily answered: The drops of course. As you can see from the items you need to create each monster, there is one thing they have in common. One is an item you can get hold of very easy and one is pretty hard to get (with two exceptions, more on that later). These 'monsters' invariably drop the hard to get items in a greater number than you use to create them. To give an example of the Spidine: Buy, or catch, sardines, find one Red Spiders egg and you now have a close to unlimited supply of those eggs. The same goes for all the other monsters. The two exceptions are the Swordchick, which drops feathers (and consumes both items to boot), and the Frogeel, which drops Cave Eel. Well, that question is a bit hard to answer. If you have a medium combat level it is no use to create the higher leveled monsters. Even at high levels you need to ask yourself is it really worth to go through all the trouble of finding a decent supply of Giant Frog's legs to gain multiple Cave Eels. Sure they do give 115 cooking xp and they heal between 5-11. 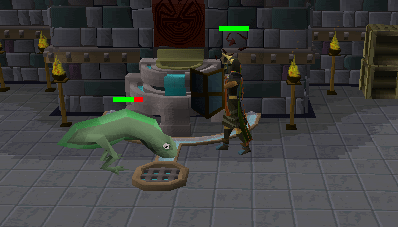 But to kill those level 99 Giant Frogs for that? The Jubster could be an alternative for those who like to cook though. Jubbly meat heals 15 when eaten, and brings 160xp when cooked. There is a drawback to this one too: You need to cook it on a fixed Ogre spit, and there are only two of those around, one at Rantz and one at the entrance to Jiggig (from the Zogre Flesh Eaters quest). 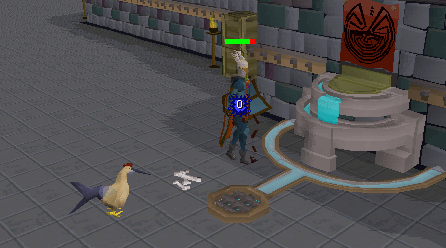 There certainly are easier ways to get feathers than having to catch or buy Swordfish, kill chicken, and then kill a level 46 Swordchick to get between 2-50 of them. So that leaves us with the other three: The ones that drop secondary ingredients for some potions. And those are exactly what can make it worth your while. Unicorn horns are notoriously hard to get: Only one place with a large enough number around to kill to make it worth your while and that is in the wild. Black Unicorns are the only viable source of Unicorn horns around but each kill only yields one. Sure there are others around but it takes a while to collect them. Here you have the possibility to get multiple horns per kill (between 2-9), the Unicow is only level 25 with 240 Life Points. Red Spiders Eggs is another of those ingredients that is fairly hard to get. 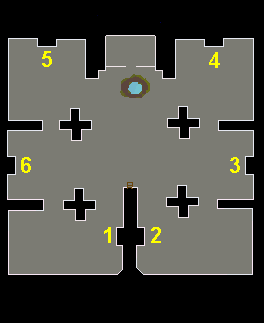 Only one spawn reasonably close to a bank and that too is in the wild: level 6 in the wilderness part of Edgeville Dungeon. Spidine obliges you by dropping between 2 and 10 per kill. Eye of Newts can be bought at various Herblore shops around but they are not that close to a bank, even when you can use Amulet of Glory teleport, or Falador teleport. Newtroost offers an alternative, dropping between 1 and 17 of them, at level 19 not that hard an adversary. The only way to use this method efficiently is to make use of the Fairy Rings (code is DJP) and bank in Zanaris. You could run to Ardougne south bank but that takes a reasonable amount of time. If you are not able to use the Fairy Rings only Unicorn horns and Red Spiders eggs are worth the effort. Drops other than those mentioned are: Tea flasks, various color Satchels and the Frogeel can drop Long and Curved bones. Please refer to the monster list for more information. All monsters drop bones. All monsters CAN drop Tea Flasks. These flasks hold 5 cups of tea, though they are drunk from the flask. Satchels come in various colors and are listed for each monster. Satchels can hold 1 Triangle Sandwich, 1 whole Cake, 1 Banana. Satchels of the same type will NOT stack in your bank! When wielded (in the shield slot) satchels can function as an emote enhancer for the 'beckon' emote. Frogeel is level 108 with 900 Life Points. He can hit a maximum of 90 and will drop up to 11 Cave Eel. The satchel that can be dropped is the Plain Satchel. A more important drop can be a Long Bone or a Curved Bone which can be sold in Dorgesh-Kaan for money and Construction experience. At level 87 and 600 Life Points, Jubster can hit a maximum of 70 on you and will drop up to 10 Jubbly meat. This time the satchel that could be among the drops is a Gold Satchel. At level 42 with 350 Life Points Swordchick is the biggest disappointment in this dungeon. It is the only creature that consumes both items to create a third. Swordchicks drop feathers and only up to 50 of them. Satchel dropped is the black variety. Level 42 Spidine with 350 Life Points is an interesting animal. It drops up to 10 Red Spiders eggs. On average you can expect 3 eggs per sardine spent. The other item that can be dropped is a Red Satchel. To give an idea about how effective this creature can be. On a world with around 800 players and with not one of those at Edgeville dungeon this method of collecting is faster. Unicow with 240 Life Points and just level 25 is probably one of the most effective animals you can make. Start with one unicorn horn, about 50 cow hides and you are bound to end up with around 100 unicorn horns. Apart from the horns Unicow will part with a Green Satchel once in a while. Without a doubt this method is faster than any other way to collect Unicorn Horns, save buying them from other players. The lowest leveled creature you can create is level 19 Newtroost, with 180 Life Points the easiest of all opponents. Made from a Feather and an Eye of Newt it is also a secondary ingredient dropper. You will need around three kills to fill your inventory with Eyes of Newt. Apart from that Newtroost can drop a Runite Satchel. Compared to buying the Eyes of Newt at Betty in Port Sarim and using a Glory Amulet transport to Draynor Village this method is about as effective. 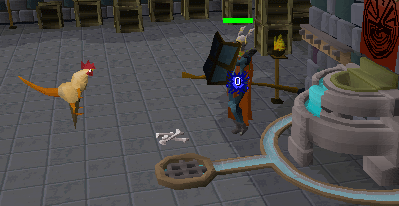 Using Falador teleport is slower.